Grave marker for Albert B. Amiday, Jr. in Section 10 Site 524 of the Santa Fe National Cemetery, Santa Fe (Santa Fe county), New Mexico. 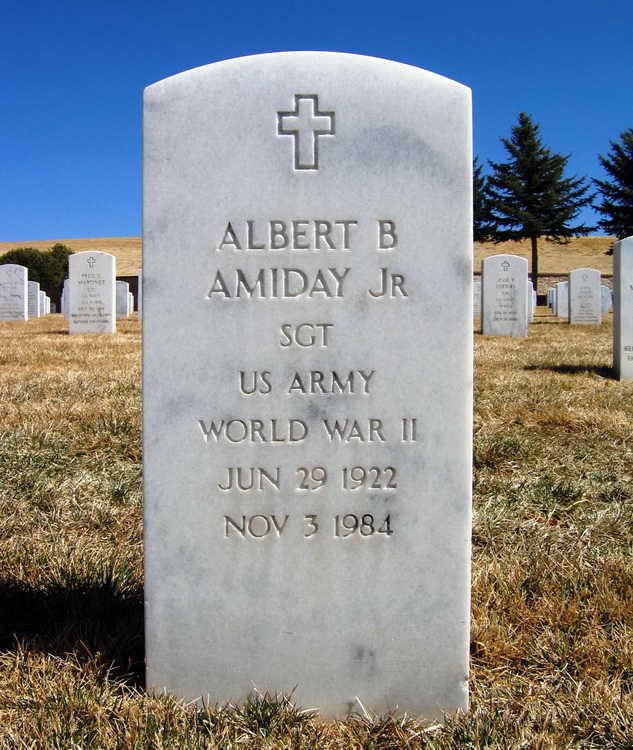 Albert enlisted in the Army at Pueblo, CO on 26 August 1942 and may have been immediately assigned to the either Hq 2nd or Service Company, 508th PIR, but those records are unavailable. However, on 2 March 1944 Pvt Amiday was relieved from being attached to Service Company and was transferred to Hq 2nd. Pvt Amiday was promoted to Pfc on 29 January 1945 and was apparently elevated to the rank of Sergeant before being discharged on 28 December 1945.